Winterizing Portable Restrooms. 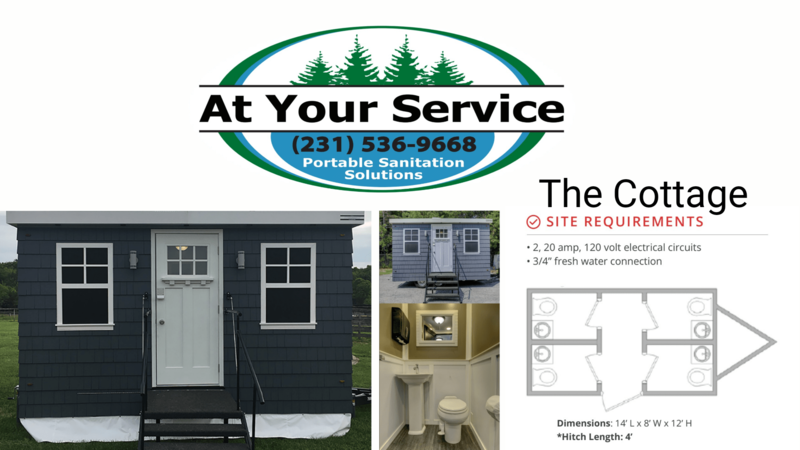 At Your Service Plus INC. Portable Restrooms & Sanitation. At Your Service Plus INC. Portable Restrooms & Sanitation. What kind of care should be taken in the winter to prevent my portable restrooms from freezing up? Anyone who has been in the portable restroom business above North America’s frost line has had to find a way to prevent liquid wastes from freezing in order to do their job. There are several different methods available. The method you use may depend on the size of your operation, the dumping requirements in your area, the number of units you served in the winter, and the average number of below freezing days you must deal with each year. Operators in Alaska, Canada and some of the most northern parts of the US must be prepared for up to 8 months of potentially freezing weather with temperatures that can drop to -30°F or colder. Down below the Mason-Dixon Line, operators may face only a few weeks of freezing days per year. There are two ways to deal with freezing temperatures. You can be proactive or reactive. Being proactive means you have prepared long in advance of the freezing weather, then throughout the winter you watch the Weather Channel and prepare your antifreeze formulations according to what temperatures are expected in the week ahead. Being reactive is when you are taken by surprise on a January morning when you start getting phone calls from your drivers explaining why they can’t pump today. Obviously, it’s better for business to plan ahead. Brine solutions are probably the least expensive way to fight freeze-ups in moderately cold climates. If your winter weather rarely, if ever, drops below 0 F, then investing in a brine system may be the best way to go. A half-pound of rock salt per gallon of water will keep tanks from freezing, down to 26 F. The more salt you add, the better your freeze protection will be until you get to the eutectic point-that’s, the point at which adding more won’t help, because the salt won’t stay in solution. For NaCl, this point arrives at 2 lbs. per gallon. With this amount of salt, your tanks will be safe down to 0 F. If it’s colder than 0, a pure brine solution can’t help you. You can save money on rock salt by listening to weather forecasts and adjusting your salt levels to the predicted temperature extreme. You wouldn’t want to spend the money on 2 lbs. per gallon on days when a half-pound would do. One of the easiest ways to adjust your brine level is to make a tank of pure brine, 2 1/4 lbs. per gallon. And add this to your fresh water. The negative aspects of using brine are that it can be very corrosive to steel and it will not protect your restroom tanks in extremely cold, (below 0) weather. You must have stainless or aluminum tanks and corrosion resistant fittings on all your trucks, or the brine will corrode them. When brine dries on the outside of trucks and restroom units it leaves an ugly white chalk stain, so be sure to wipe everything down with fresh water whenever brine is splashed or spilled. Another popular additive restroom operators use is de-icing salt or magnesium chloride (MgCl2). This can be purchased as a crystal and used just like rock salt, or it can be purchased in a 30% liquid solution. While magnesium chloride can be more expensive than rock salt, it has a lower eutectic point, which means you can add more to provide protection at lower temperatures than rock salt. A half pound per gallon of water will protect tanks at the same temperature (26 F) as rock salt, however, 2 lbs per gallon will provide protection to a much lower temperature (-20 F). And you can use as much as 2.25 lbs. per gallon before you get to the saturation point. This provides a maximum temperature of -26°F, which is good in most winters just about anywhere in the continental US. Many portable restroom operators swear by methanol to keep ice out of their tanks. Methanol is easier to mix than crystal salts because you don’t have to dissolve it, you just pour it into a tank. Methanol is also non-corrosive, so it is safe for steel-tank trucks. While methanol can be more expensive than salt, you may save on the cost of trucks and you can avoid buying large brine mixing tanks. Six and one-half ounces of methanol per gallon of water will protect tanks at 28 F. You can add more methanol for more protection, up to a mix of 33% methanol to water (approx 42 oz/gal). Anything higher than 33% and your tanks become flammable. At 33% methanol, your tanks are protected from freezing, down to -9°F. The trouble with methanol is that it can be extremely dangerous if not used correctly. Anyone using methanol should understand the National Fire Protection Association’s Flammable and Combustible Liquids Code #30 before handling this material. You can get a copy of it online at www.nfpa.org. Methanol is highly toxic when ingested and harmful if prolonged inhalation of the vapors occurs. Eye protection and rubber gloves should be used when handling or mixing the antifreeze solution. Never use undiluted methanol near electric equipment such as pumps, since the slightest spark could lead to a disaster. For extra cold weather, a methanol and rock salt combination can provide maximum freeze protection. A mix of 2 pounds of salt and 40 ounces of methanol per gallon will protect a tank from freezing, all the way down to -40°F. Rid It Hot Flakes Pellets are a chemical component blend of a few different chlorides that the operator drops directly into a fresh toilet tank. Rather than using tanks and special mixing equipment, you just carry a bucket of Hot Flakes on the truck and scoop enough pellets into the toilet and urinal of a freshly serviced unit to account for the week’s temperatures. They dissolve in solution and can protect the tank from freezing down to -25°F, which makes them even more effective than methanol or brine. Hot Flakes are a convenient solution that saves the operator the hassles of mixing corrosive salt solutions, the danger of methanol, and the extra workload and cost of switching out. In places where the weather is too cold for in-tank solutions to be economical, such as Northern Canada and Alaska, many operators use a simple switch out method. They bring a clean toilet to the site and remove the frozen one. The frozen toilet is brought back to the shop to thaw until it can be pumped and cleaned. Obviously, this wouldn’t be competitive in the lower 48, but it works up North when there’s no other way. A better solution than switching the whole unit is to use split tanks from PolyJohn. Split tanks replace the normal collection tank in a unit with a half-size, 31-gallon tank. Then rather than driving a service route with a fresh toilet for each site, the operator need only bring a new tank. The used tank is collected and returned to the shop for cleaning. A handy splash cover protects against spills. Other suggestions to prevent freezing include placing units against the wall of a building to protect them from wind, covering the vent stack to prevent wind from blowing around inside the tank, taping up vents on the windward side, or packing snow or straw around the base to protect the tank from the wind. As you may know, wind chill factor can lower the temperature of liquids, making them freeze sooner. Rid It deodorizers are compatible with any combination of brine, de-icing salt, methanol, or HotFlakes. 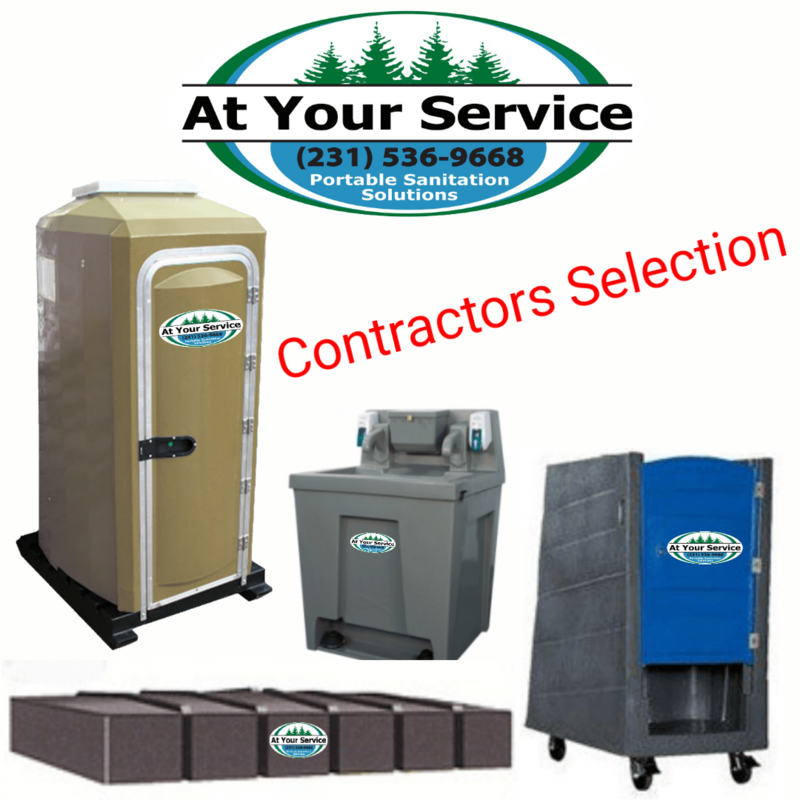 At Your Service Plus has the finest quality construction grade job site sanitation and portable restrooms available for your construction needs and projects order here now. 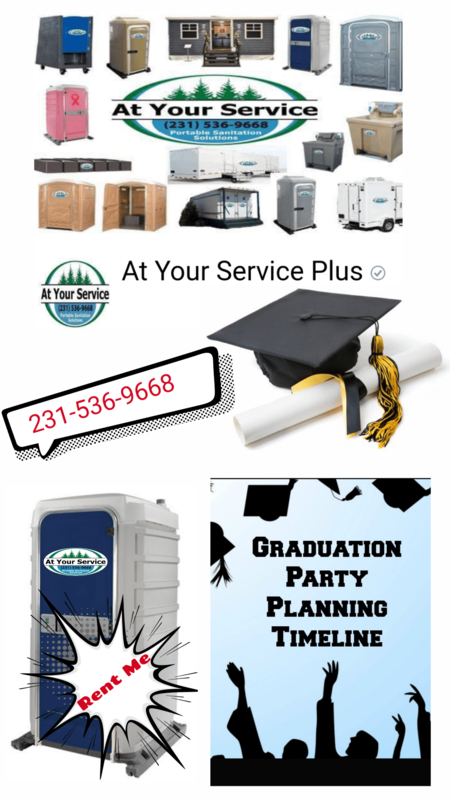 Make sure you’re ready for the Graduation season reserve your portable restroom now! Hot & cold running water AM/FM stereo. Has the products and services to handle all your portable sanitation & restroom needs. Our experienced staff will provide you with a pre-event consultation and will recommend the right products and number of units for your needs. Our installation team is always reliable, always professional.